Hello and a belated Happy New Year to all the members and supporters of Normanton 5 Towns MTS (old and new). After a great Pantomime and the relaxing (really) Xmas festivities, isn't it great to be getting back into the good old rehearsal process again? Tuesday and Thursday at 19:30pm until further notice. 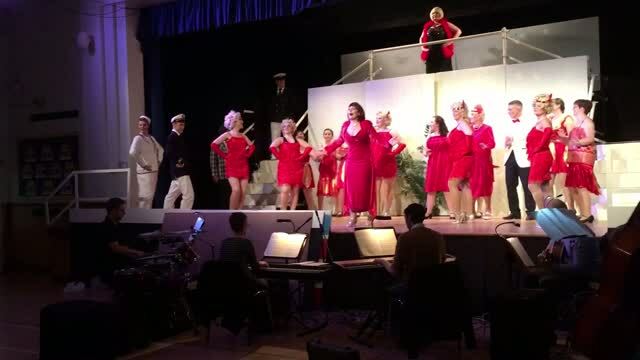 Anything Goes is a classic Cole Porter musical that we last performed nine years ago, and with the usual effort, enthusiasm and commitment that our cast and production team put in we are sure to have another amazing show to perform for the paying public of Normanton and the 5 towns area. Sadly we had a Lord Evelyn who for personal reasons had to withdraw from the role, so we are on the hunt for both a Lord Evelyn and a Witney, let the production team know if you have any suggestions or know of any one suitable for either role. PS Don't forget the after show party, Saturday 28th from 19:30pm at the Conservative Club Normanton. Enough about Anything Goes! Christmas is over so it's time for the Easter Raffle, yippee!! and we are on the lookout for your kind contributions, you know the type of thing we are after, Easter Eggs/ bottle of wine or other suitable raffle prizes, there will be a star prize probably a Large Easter Egg or a goodies Hamper, but please anything will be gratefully received, please see Stuart Gaynor or Sharon at Rehearsals. Tickets have been given out so please SELL SELL SELL!!! So please come along and join in with our FORTIES NIGHT included in your ticket price is a homemade Pie and Pea supper, a quiz and a couple of easy party games. Costume hire is available from Sharon at very reasonable rates. Following the success of our first Five Towns INDEPENDENCE DAY Barbecue and due to popular demand we are pleased to announce the date of our second ANNUAL "Independence Day" barbecue at The Poplar, Altofts is Saturday 2nd July 2016. Please speak to Stuart, Gaynor or Sharon for more details. We are currently looking at running a "Sponsored Walk" on the same day as the Barbecue WATCH this space.